"Water fuel cell" redirects here. For other purported water fueled devices, see Water-fueled car. For fuel cells, see Fuel cell. The water fuel cell is a technical design of a "perpetual motion machine" created by American Stanley Allen Meyer (August 24, 1940 – March 20, 1998). Meyer claimed that an automobile retrofitted with the device could use water as fuel instead of gasoline. Meyer's claims about his "Water Fuel Cell" and the car that it powered were found to be fraudulent by an Ohio court in 1996. 2 The term "fuel cell"
The water fuel cell purportedly split water into its component elements, hydrogen and oxygen. The hydrogen gas was then burned to generate energy, a process that reconstituted the water molecules. According to Meyer, the device required less energy to perform electrolysis than the minimum energy requirement predicted or measured by conventional science. The mechanism of action was alleged to involve "Brown's gas", a mixture of oxyhydrogen with a ratio of 2:1, the same composition as liquid water; which would then be mixed with ambient air (nitrogen, oxygen, carbon dioxide, carbon monoxide, methane, chloroflourocarbons, free radicals/electrons, radiation, among others). If the device worked as specified, it would violate both the first and second laws of thermodynamics, allowing operation as a perpetual motion machine. Throughout his patents Meyer used the terms "fuel cell" or "water fuel cell" to refer to the portion of his device in which electricity is passed through water to produce hydrogen and oxygen. Meyer's use of the term in this sense is contrary to its usual meaning in science and engineering, in which such cells are conventionally called "electrolytic cells". Furthermore, the term "fuel cell" is usually reserved for cells that produce electricity from a chemical redox reaction, whereas Meyer's fuel cell consumed electricity, as shown in his patents and in the circuit pictured on the right. 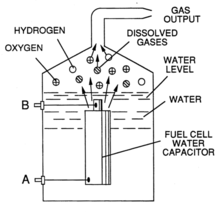 Meyer describes in a 1990 patent the use of a "water fuel cell assembly" and portrays some images of his "fuel cell water capacitor". According to the patent, in this case "... the term 'fuel cell' refers to a single unit of the invention comprising a water capacitor cell ... that produces the fuel gas in accordance with the method of the invention." In a news report on an Ohio TV station, Meyer demonstrated a dune buggy he claimed was powered by his water fuel cell. He estimated that only 22 US gallons (83 liters) of water were required to travel from Los Angeles to New York. Furthermore, Meyer claimed to have replaced the spark plugs with "injectors" that introduced a hydrogen/oxygen mixture into the engine cylinders. The water was subjected to an electrical resonance that dissociated it into its basic atomic make-up. The water fuel cell would split the water into hydrogen and oxygen gas, which would then be combusted back into water vapor in a conventional internal combustion engine to produce net energy. Philip Ball, writing in academic journal Nature, characterized Meyer's claims as pseudoscience, noting that "It's not easy to establish how Meyer's car was meant to work, except that it involved a fuel cell that was able to split water using less energy than was released by recombination of the elements ... Crusaders against pseudoscience can rant and rave as much as they like, but in the end they might as well accept that the myth of water as a fuel is never going to go away." To date, no peer reviewed studies of Meyer's devices have been published in the scientific literature. An article in journal Nature described Meyer's claims as one more "water as fuel" myth. In 1996 Meyer was sued by two investors to whom he had sold dealerships, offering the right to do business in Water Fuel Cell technology. His car was due to be examined by the expert witness Michael Laughton, Professor of Electrical Engineering at Queen Mary, University of London and Fellow of the Royal Academy of Engineering. However, Meyer made what Professor Laughton considered a "lame excuse" on the days of examination and did not allow the test to proceed. According to Meyer, the technology was patent pending and under investigation by the patent office, the Department of Energy and the military. His "water fuel cell" was later examined by three expert witnesses[who?] in court who found that there "was nothing revolutionary about the cell at all and that it was simply using conventional electrolysis." The court found Meyer had committed "gross and egregious fraud" and ordered him to repay the two investors their $25,000. Stanley Meyer died suddenly on March 20, 1998, while dining at a restaurant. His brother claimed that during a meeting with two Belgian investors in a restaurant, Meyer suddenly ran outside, saying "They poisoned me". After an investigation, the Grove City police went with the Franklin County coroner report that ruled that Meyer, who had high blood pressure, died of a cerebral aneurysm. Some of Meyer's supporters believe that he was assassinated to suppress his inventions. Meyer's patents have expired. His inventions are now in the public domain, available for all to use without restriction or royalty payment. No engine or vehicle manufacturer has incorporated Meyer's work. ^ a b c d e f Dean Narciso (July 8, 2007). "The Car that Ran on Water". The Columbus Dispatch. Archived from the original on 14 February 2008. Retrieved 24 March 2008. ^ a b c d Edwards, Tony (1996-12-01). "End of road for car that ran on Water". The Sunday Times. Times Newspapers Limited. p. Features 12. ^ a b c d e f Ball, Philip (September 14, 2007). "Burning water and other myths". Nature News. doi:10.1038/news070910-13. Retrieved 2008-12-08. You start with water, you break it apart into its constituent elements (hydrogen and oxygen), and then you recombine them by burning. (...) Extracting net energy from this total cycle is impossible, if you believe in the first and second laws of thermodynamics. Otherwise, you have the basis of a perpetual-motion machine. (...) He died in 1998 after eating at a restaurant; the coroner diagnosed an aneurysm, but the conspiracy web still suspects he was poisoned. ^ The Columbia Encyclopedia (Columbia University Press, 2004) defines "fuel cell" as an "Electric cell in which the chemical energy from the oxidation of a gas fuel is converted directly to electrical energy in a continuous process"; and electrolysis as "Passage of an electric current through a conducting solution or molten salt that is decomposed in the process." ^ Whittingham, M. S.; Savinell, R. F.; Zawodzinski, T. (2004). "Introduction: Batteries and Fuel Cells". Chem. Rev. 104 (10): 4243–4244. doi:10.1021/cr020705e. ^ Winter, M.; Brodd, R. (2004). "What Are Batteries, Fuel Cells, and Supercapacitors?". J. Chem. Rev. 104 (10): 4245–4270. doi:10.1021/cr020730k. PMID 15669155. ^ Robinson, Ralph (Reporter), Tom Ryan (News caster) and Gail Hogan (News caster) "Unknown Episode [Videorecording (Broadcast)]" Action 6 News. Unknown Network. Station call sign: WSYX. Filmed in Groveport. Length: 1 Minute 45 seconds. Republished by Annaheim, Kurt W. "Media Page - See, Hear and Discover Free Electricity." File name: stan_meyers_bb.wmv Archived 2008-06-25 at the Wayback Machine. Last updated 7 May 2008 Archived 14 February 2009 at the Wayback Machine. Befreetech.Com. Accessed 23 June 2008. ^ [permanent dead link] Lieutenant Steven Robinette of the Grove City Police Department talks about the investigation into Stanley Meyer's death. Robinette was in charge of the detective bureau at that time. quote: "The one thing that was based on science." ^ "General Information Concerning Patents". uspto.gov. ^ "HHO "run your car on water", a guide for journalists". aardvark.co.nz. ^ "I get mail: Brown's Gas and Perpetual Motion". scientopia.org. "Stanley Meyer's Water Fuel Cell". Archived from the original on August 20, 2014. Retrieved August 25, 2018. Fuel for fraud or vice versa? (On Stanley Meyer) — summary of the article in New Energy News. This page was last edited on 6 April 2019, at 20:08 (UTC).